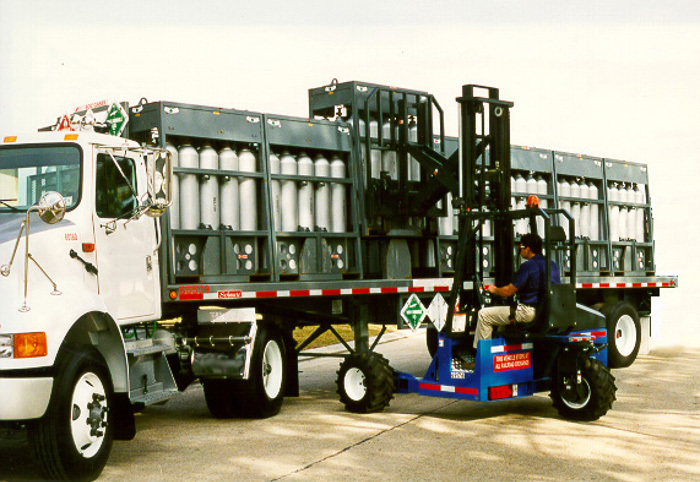 The Princeton PiggyBack® Delivery System is a proven method for delivering bottled gas that has revolutionized customer service and delivery efficiency. Since 1968, the European Gas Industry has used truck-mounted forklifts for their bottle deliveries. A PiggyBack® can be mounted behind almost any existing truck or trailer. In some cases PiggyBacks can even be combined with existing lift gates. The unit is ready for operation in less than 60 seconds. Instead of rolling bottles, the driver can pick up an entire pallet, and get it close to the exchange point. Or, it can be used to exchange entire pallets. The PiggyBack® works with any pallet system (eg. Weldcoa) and can increase your productivity with as much as 35%. Princeton offers models tailored towards the demanding needs of the bottled gas industry.